This month, Enprise co-founder and former CFO, Elliot Cooper has taken up the CEO role at Enprise Group and I have shifted to a new role as CEO of our Cloud start-up business, Datagate Innovation Ltd.
Elliot and I have worked together in a number of technology businesses, starting from PC Direct in the mid 1990’s, then Exonet (creating the software now known as MYOB EXO), then Datasquirt, Enprise and EMS-Cortex. Elliot was the initial designer of our popular “Enprise Job” Job Costing module for SAP Business One. The product is often praised as having the best General Ledger integration of all the Project Costing modules available for Business One and this is thanks mainly to Elliot’s initial design. After being the CEO for thirteen years, it makes a nice change for me to go back to running an early stage start-up business, along with another of my long-term colleagues, Steve Southon. Enprise Group is in good hands with Elliot at the helm. Nobody knows that business better than he does and he’s been there right from the start. This week we gained a new senior consultant and team leader for our Melbourne branch. 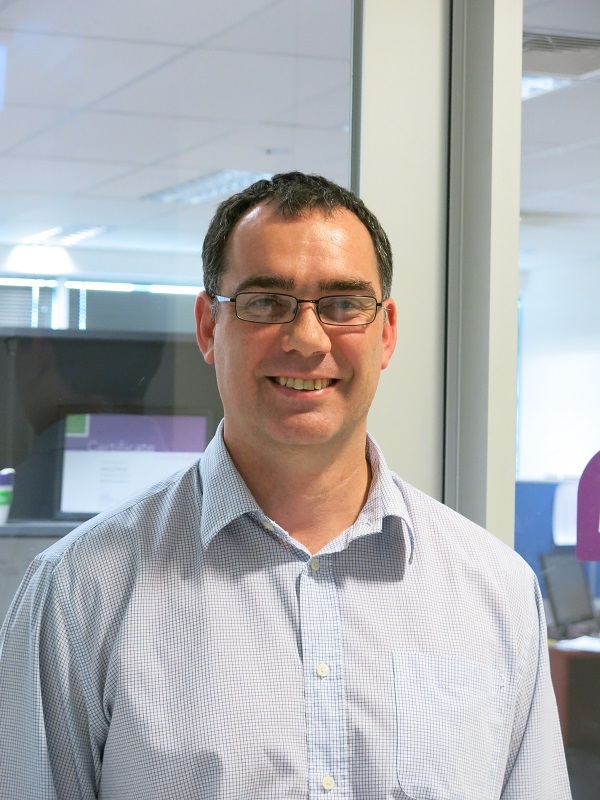 Sean Cooper has extensive experience in a number of mid-market ERP systems, in particular MYOB EXO and MYOB Advanced. We are delighted to welcome Sean to our team. His appointment lifts Enprise’s local capability to implement and support both MYOB EXO and MYOB Advanced in Australia, particularly the Melbourne region. Today Enprise Group announced its acquisition of the MYOB practice of New Zealand software services company, Global Bizpro Ltd. The deal brings together two top MYOB Enterprise partners to form a combined business with around 850 mid-market business customers and by far the largest team of qualified MYOB consultants in New Zealand, with branches in Auckland, Hamilton, Wellington, Sydney and Melbourne. From a customer perspective the deal continues our strategy to grow our business by striving to deliver the very best customer service and support for MYOB EXO customers across Australia and New Zealand – “The Gold Standard in MYOB EXO service”. The Global Bizpro acquisition adds scale and further depth of expertise to the Enprise team and improves our ability to give exceptionally good service and support to our customers. The additional scale and resources are also important as we ramp up to support MYOB’s powerful new mid-market Cloud ERP software “MYOB Advanced”. I predict that MYOB Advanced will take the New Zealand and Australian ERP market by storm this year. MYOB EXO is the leading business software solution used by mid-sized companies and organizations across New Zealand and Australia. MYOB EXO is a client server, on-premise solution which is still the preference of many businesses. Other businesses are looking for a Cloud solution. MYOB Advanced is a very powerful and sophisticated Cloud offering. It leapfrogs existing Cloud competitors and we already have a number of new customers who are ready to go with MYOB Advanced. Accordingly we have invested considerably in upskilling to provide the same levels of support for MYOB Advanced as we do for MYOB EXO. We see a strong future for both MYOB products. There was exciting news this week as MYOB officially released MYOB Advanced, a new Cloud-based ERP & business management platform for mid-sized New Zealand and Australian businesses. While newly released in New Zealand and Australia, MYOB Advanced is based on the American Cloud ERP called Acumatica, which MYOB invested $13.3M into last year. Acumatica is a powerful and successful Cloud ERP, proven in the American market, whereas MYOB Advanced is optimised for the New Zealand and Australian market. Over the last year, Enprise has invested in evaluating, understanding and getting staff formally trained in MYOB Advanced. We see this as a powerful and complementary addition to the MYOB EXO product range, giving Enprise customers the choice of either an on-premise ERP solution with MYOB EXO or a Cloud solution with MYOB Advanced. Hosted MYOB EXO is another popular option. At this early stage Enprise has already sold MYOB Advanced to one customer and we have a number of other prospective customers in the process of signing up. Watch this space, I think this product is a winner! This morning at 11am NZ time, Enprise Group was listed on the NZAX board of the New Zealand Securities Exchange (NZX). The shares opened at 32 cents, peaked at 60 cents and closed the day on 55 cents. Ladies and Gentlemen, welcome and thank you for joining us here today for this very special event in the history of Enprise Group. 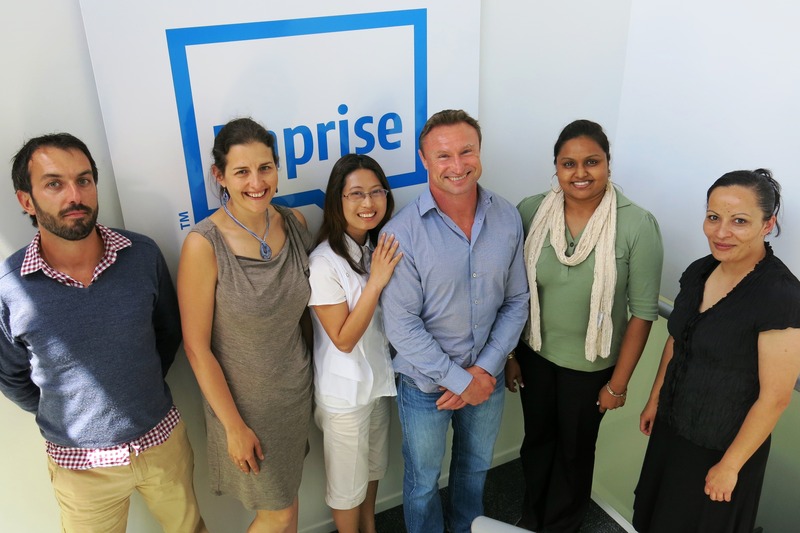 Today Enprise is a small software group with big aspirations. At this time we own three software businesses that provide world-class financial & business management solutions to medium sized businesses in New Zealand, Australia and around the world. Today we are setting off on a new journey as a public listed company in New Zealand on the NZAX board. Previously, when we were known as Datasquirt Ltd, we were listed in Australia on the ASX board and following the sale of the Datasquirt business to LiveOps of Silicon Valley, we were briefly listed on the Australian NSX board before we delisted in October to cross the Tasman to NZAX. We have some success stories behind us – where we created software businesses and solutions that we grew and sold to larger international companies. In all we have created value for our customers, partners, staff and shareholders. Going forward we are in the business of creating many more business successes by utilizing the talented and creative people we have in New Zealand and Australia. Taking our software and services to the world and to our own home markets in New Zealand and Australia. We have strong, long-standing strategic partnerships with global powerhouses; MYOB, SAP and Microsoft. We have exciting new Cloud and mobile software solutions lined up for 2015. Watch this space. We have a talented team of software professionals in which we will continue to invest in and grow. We will be looking for new software businesses, new people and new opportunities that leverage the powerful partnerships and global channels to market that Enprise Group has today. Today we are but a small software group, but we have big aspirations and a vision for the future. We are looking for long-term investors to join us on this new journey. Today is a great time to get on board. This is a compliance listing with the NZAX, which means that Enprise is not issuing new shares to the market at this time. Thus we offer an opportunity for all existing Enprise Group shareholders to trade their shares and for New Zealand investors to join us on our way into a prosperous future. I can tell you that I am not selling any of my Enprise shares and have no intention to sell for the foreseeable future. Thank you again for joining us on this auspicious occasion. Enprise Group will list on the NZAX board on Monday 1st December 2014 under the code “ENS”. Our team at Enprise has a strong history of building successful software businesses that have been sold to larger multinational companies and thereby produced good returns to New Zealand investors. Each of these businesses has been based in New Zealand and all but one has predominantly sold its products overseas and within New Zealand. Now that Enprise has proven its ability to build successful software businesses and return significant value to shareholders by exiting those businesses, we are about to embark on a new chapter of our evolution, which is to build a public New Zealand-based company which becomes a large profitable technology group that will return long-term value to its shareholders, staff and customers. The “New Enprise” will be a cash earner, not a cash burner. We hope to attract investors with a long-term view, rather than speculators who look to the short term. We will be looking to grow our business by acquiring businesses that add value to our group and strategically align with our existing businesses. Enprise Group is a platform for growing global software businesses. That platform already includes strong international partnerships with software giants SAP and MYOB, as well as a channel of nearly one hundred accounting software re-sellers who sell or have sold Enprise products, throughout North America, Australasia, Africa and the UK. Enprise already has a trusted brand around the world with it’s own SME-focused re-seller channel. As an example of Enprise’s M&A strategy; Enprise Group recently acquired Datagate Innovation which is an early-stage start-up that has built a Cloud-based multi-tenanted billing and analytic portal for Telco and Utility companies. There is huge demand for that product in New Zealand and Datagate already has a queue of local clients waiting, as well as a strategic relationship with a major New Zealand Telco. Our strategy is to prove the business model in New Zealand, establish a base of reference clients – and then take the product to the world, leveraging our international base of partners. This is a strategy similar to what Enprise followed previously with EMS-Cortex, which successfully grew its international base of Telco customers before being sold to Citrix Corporation. When I invest, I invest predominantly in people – and I base that on their track records. I encourage potential investors to research the track record of Enprise Group and compare what was achieved in the past with what we are aiming to do in the future. We are looking to build our base of long-term investors to join us on this journey. That is why Enprise is listing on the NZAX on Monday 1st December. Enprise Group and its team have a strong track record in building valuable businesses. Here are some high-profile, high-value businesses that form part of Enprise’s value-creation history. PC Direct manufactured, distributed and supported personal computers under its own brand in New Zealand. Its sales channel was the direct, phone-based, channel by-passing the reseller network. Growth of PC Direct to become the #1 reseller of desktop computers in New Zealand was leveraged off the company’s integrated system – linking design, inventory, production, sales, despatch, service and accounting. The systems developed by PC Direct provided one of the company’s main competitive advantages. Enprise CEO Mark Loveys, Enprise CFO Elliot Cooper and Enprise Datagate COO Steve Southon were all members of the executive management team of PC Direct and all made significant contributions to building the automated systems of the business. Exonet was an ERP software company founded by Mark Loveys, Maurice Bryham and David McKee Wright that developed the Exonet suite of business software that is the top-selling mid-market ERP in Australia and New Zealand, owned by MYOB and known as MYOB EXO. Enprise Solutions is the top reseller of MYOB EXO in New Zealand with sales offices in Auckland, Hamilton, Wellington, Sydney and Melbourne. Enprise CEO Mark Loveys was a founder and original developer of Exonet. Enprise CFO Elliot Cooper was CFO and a product designer. Enprise Datagate COO Steve Southon was Development Manager. Datasquirt was a Cloud software company that developed a non-voice multi-channel messaging solution for corporate contact centres. Datasquirt floated on the ASX in 2007 and had offices in Auckland, Sydney and London. The business was sold in 2011 and the remaining listed shell acquired the Enprise businesses, renaming itself to Enprise Group Ltd.
Enprise CEO Mark Loveys was a founder and original developer of Datasquirt. Enprise CFO Elliot Cooper joined as CFO. Enprise directors Lindsay Philips and Jens Neiser were directors and investors in Datasquirt. Enprise CEO Mark Loveys and Enprise CFO Elliot Cooper were CEO and CFO respectively, while EMS Cortex was a division of Enprise. Today our focus is on building the businesses of Enprise Group, which are Enprise Solutions, Enprise Software and Datagate Innovation. Enprise Group Ltd will be listed on the NZAX stock exchange under the code “ENS” from Monday 1st December 2014. It was only May last year when Wellington’s economy looked so bleak that even our prime minister John Key referred to it as a “dying city”. “All you have there is government, Victoria University and Weta Workshop” he said. From my perspective today at Enprise Solutions and the business of selling MYOB EXO business management software to a wide cross-section of medium-sized NZ businesses; Wellington’s small to medium business owners have switched on to investing for growth and I would say that they are more optimistic about the general business climate than we’ve ever seen before. The last quarter of 2013 saw Enprise sell more than three times as many MYOB EXO systems in Wellington as the same quarter the previous year. December and January were record months for new Wellington-based MYOB EXO ERP software sales, with February shaping up to look even better. Enprise’s other New Zealand branches in Auckland and Hamilton are also experiencing an upsurge in demand now that confidence is returning to the New Zealand business climate. Businesses owners are realizing that they need to invest in putting strong operational and financial systems in place to compete and capitalize on the opportunities of a more buoyant market. There is also a strong shift towards Cloud Computing and almost half of all the MYOB EXO systems we sell are hosted in the Cloud by our associate company 2Cloud.biz. In Australia, Enprise has offices in Sydney and Melbourne which also focus on selling MYOB EXO software to the larger local SME businesses. Australian business confidence took a hit last year before the election and we noticed a drop-off in business software investment. Following the election, we are seeing a recovery in business sentiment and we’re now very optimistic about Australian sales in 2014. When it comes to selling MYOB EXO business management solutions, Enprise’s strategy is to give consistent, responsive, top-quality after-sales support to our existing customers. It stands to reason that well-supported customers, who get value, return on investment and competitive advantage out of their software are far more likely to refer and recommend our services to other prospective customers. Many of Enprise’s customers have had their success stories published among our extensive list of on-line case studies. Enprise has always had a centralized customer support team consisting of experienced, certified MYOB EXO consultants, available on-call to support our customers throughout New Zealand and Australia via our support web site, email and telephone. In addition to the centralized team, we also have experienced MYOB EXO certified consultants at each of our five branches in Auckland, Hamilton, Wellington, Sydney and Melbourne, meaning that localized and on-site support can also be provided when needed. We believe that our dedicated, full-time support team, which is totally separate to our software implementation teams, gives Enprise distinct competitive advantage over our competitors, most of whom try to stretch their same consultants across supporting existing customers whilst at the same time implementing new systems. Enprise’s larger Trans-Tasman team also enables us to have specialists who have deep knowledge on various subject areas, such as Payroll, Human Resources, Job Costing, Inventory Planning – to name a few. Success breeds success; Enprise’s success is built on the success of our customers.